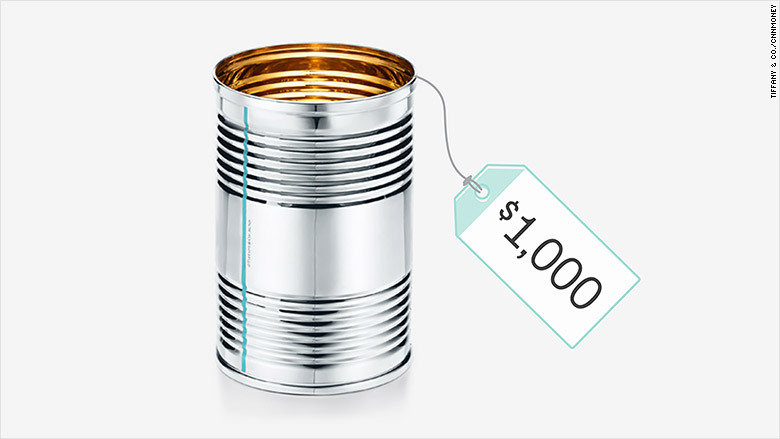 Tiffany is hoping its glittery new $1,000 "tin" can will help catch the eyes of Millennial shoppers. Or maybe it will be a $9,000 spool of yarn that does it. 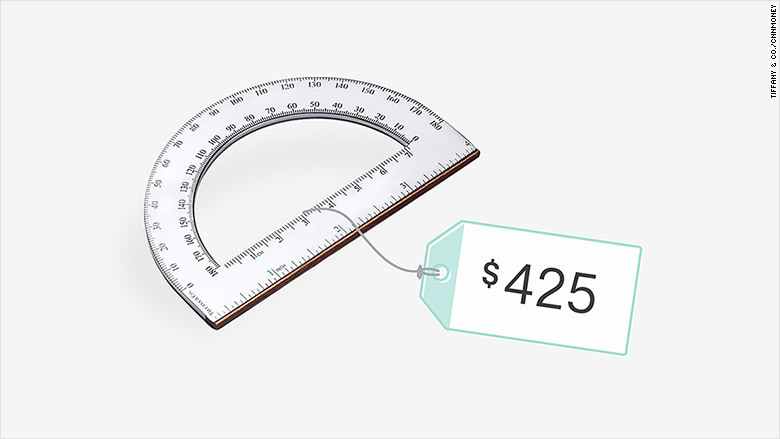 Or a $10,000 bird's nest or $425 protractor. All in sterling silver, of course. The iconic jeweler recently announced a new luxury home and accessories collection of "everyday objects." The line was "born out of the notion that beautiful things should not be limited to special occasions," Tiffany said. "I think what makes the collection unique is that it incorporates the best quality, craftsmanship and design with a level of functionality that allows you to use these things every day," added Reed Krakoff, Tiffany's chief artistic officer. "Functional" was not a word used by many social media users when discussing the collection, however. "This $1,000 tin can is the new $80 rock in a pouch," one Twitter user wrote, referring to Nordstrom's notorious $85 leather-wrapped stone. "For when you have way, way more 💰 than sense," said another. 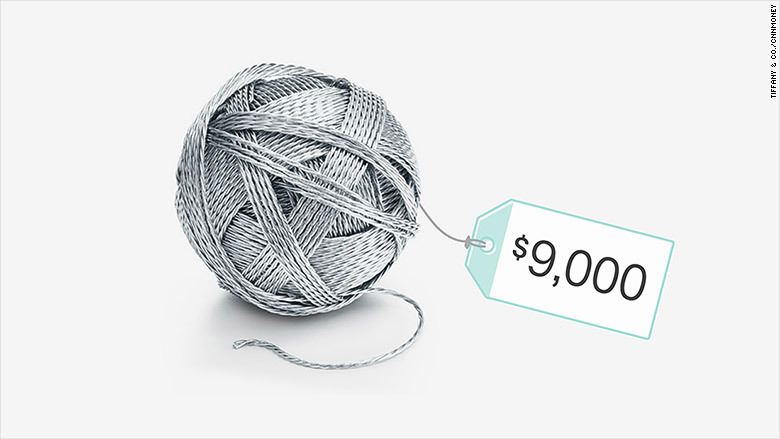 On Instagram, one commenter wondered "what am I to do with a worthless $10,000 bird nest?" But online snark doesn't mean Tiffany (TIF) missed the mark, said Brian Tunick, an analyst with RBC Capital Markets. In fact, it may have been part of the plan. "If they can create a little buzz around it, [the line] will be viewed as a victory," Tunick noted. The collection could help solve two of Tiffany's big problems, Tunick said: The store is suffering from reduced foot traffic and isn't attracting Millennial shoppers. Now, people may stop by a Tiffany store once or twice a year to buy an expensive gift for a special occasion. An expanded home accessories line with more than 1,280 items ranging in price from $25 to $10,000 could lure people in on a more regular basis, according to an RBC analysis of the collection. Items from the collection will be featured in Tiffany's first-ever cafe, opening in its flagship 5th Avenue location on Friday. The Blue Box Cafe is part of the New York City store's fourth-floor renovation, which Krakoff described as "experimental and experiential," adding that it is "a modern luxury experience." It's important for Tiffany to cultivate a relationship with Millennial customers now, explained Tunick, so that the shoppers will keep the retailer in mind later in life, when they may want and be able to afford Tiffany's more expensive items. And curious, or skeptical, young shoppers might be encouraged by the online conversation around the new items to walk into the store and check out the objects for themselves. "Trying to increase the frequency of traffic into the stores is certainly the number one objective," Tunick said. So if someone who walked into the store to catch a glimpse of a $10,000 bird's nest walked out with a $25 shot glass, that could be considered a win. 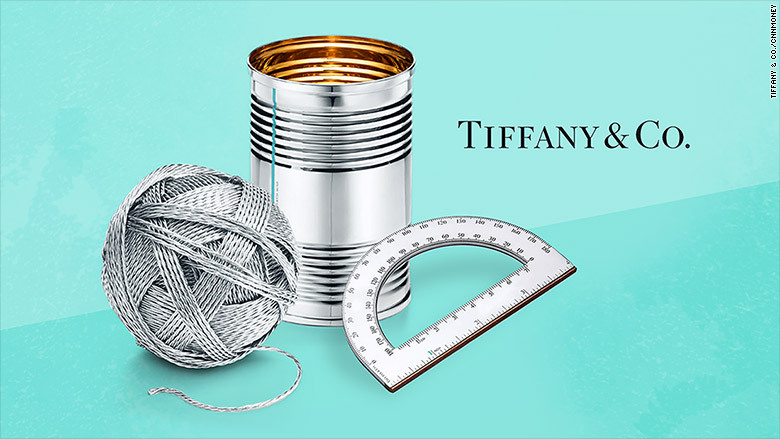 Tiffany acknowledged a certain ironic sensibility to the collection. "These covetable accessories possess a whimsical wink that is quintessentially Tiffany," the company said in a statement. "The luxury house is known for its tongue-in-cheek approach to design." Tunick said that analysts have "been anxiously waiting for this collection for about a year now." Since the start of 2017, Tiffany has replaced its CEO and installed Krakoff in the new position of Chief Artistic Officer. Before the shakeup, Tiffany's management tried to court Millennials by making Lady Gaga the face of a new fashion jewelry collection, Tiffany HardWear. But, Tunick said, the company wasn't moving very quickly. "This is sort of the first step in moving fast enough," he said of the new line. The line hit stores on November 1.